Just for the record, since then Jade has found my original contact letter from about 26 years ago (which he amazingly still has to this day), it has been established that this logo was indeed done by me. 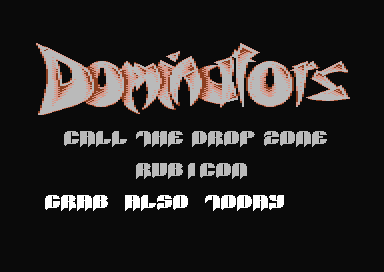 Best logo ever made on the c64! Really nice logo ruined by the rest. sorry to disappoint, but that thing is something I drew. :) I am really glad it is appreciated. I agree DMC, I am sure you was the man behind one of our best logos ever. Salute you old buddy! The logo looks like something I did back in'90, although I could easily be mistaken ! Anybody got a clue who did that logo?